Low carb or keto mozzarella sticks sound like a myth. A dream even. I mean, how on Earth are you going to bread mozzarella sticks without bread? Does not compute. But you can, I did, and you will. And they will be perfect. Well, if you saw our Keto “Breaded” Chicken Tender recipe, that might give you a little hint. When I first sought out to make low carb mozzarella sticks I hit Google to see what options there might be. The first one I came across was a man named Shaun’s recipe for mozzarella sticks that used powdered parmesan cheese as the breading. If you’ve never heard of Shaun he used to run username_dopeaf on Instagram. He was basically a low carb guru as far as many were concerned, including myself. He was always dropping knowledge on social media but we unfortunately haven’t heard from him in a good while. Keto mozzarella sticks too good to be true? Anywhoooo…. They sounded amazing, keto mozzarella cheese sticks breaded in Parmesan cheese. I mean, that’s cheese on cheese. Layers of cheese. Cheese inception, if you will. And they were absolutely amazing, gooey, cheesy, and uh…what’s the word I’m looking for? But I had a tiny minor eensie weensie beef with the keto mozzarella sticks. They were some delicate little things. I mean the Parmesan cheese layer was so delicate and crispy, it was almost annoying. So to fix this problem I went ahead and added some ground pork rinds to the breading mixture to add some bulk. Adding the pork rinds made the outer layer more sturdy, making these low carb mozzarella sticks better for what they were intended for. Dipping. Or something like that. No judgements here. These really are THE perfect keto mozzarella sticks. I would even say they’re BETTER than traditional mozzarella sticks. Try them for yourself and see! If you don’t want to eat your mozzarella sticks right away rest assured that they freeze beautifully. Just skip the step of frying and pop the frozen sticks in a sealed freezer bag. They’ll keep in the freezer for up to 3 months. Low carb mozzarella sticks that are delightfully crispy on the outside with that ooey gooey middle we all know and love. Cut your mozzarella sticks in half and set aside. Prepare a baking sheet with parchment paper and set aside as well. Grind the pork rinds in your food processor, I use my Cuisanart Smart Stick for this. then add pork rind “breading” to a bowl along with the Parmesan cheese and desired seasonings. In a separate dish, whisk 2 eggs. Dip each mozzarella stick into the eggs, then into the breading mixture. 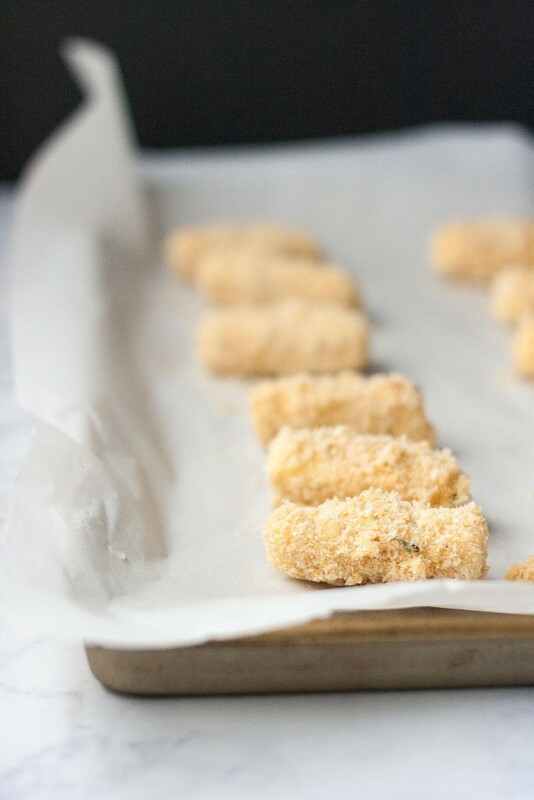 Place each breaded mozzarella stick on the parchment lined baking sheet and freeze for about 15-20 minutes. Remove chilled mozzarella sticks from the freezer and repeating the breading procedure, dipping in the eggs and then in the pork rind “breading”. This will give you a nice sturdy coating. Freeze in the freezer for at least an hour. At this point you could even store them in the freezer for quick frying on a later date. Heat oil to 350 degree. Fry each frozen mozzarella stick for about 2-3 minutes, until golden brown. Serve hot with marinara sauce if desired. Very nice low carb version! I have been hearing good things about pork rinds as a breadcrumb substitute and need to give this a try.